Next weekend we will be launching a new rubric in "My Gear And Me - Gold Selection", that rubric will be called "My Gear And Me - Member of The Week". 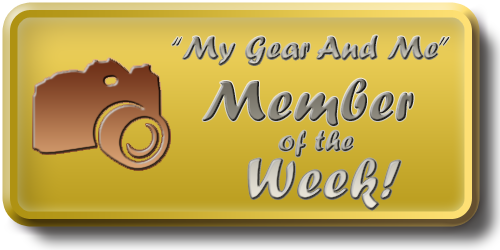 Each week (if possible), all moderators can point one member of "My Gear And Me - Gold Selection" to be the member of the week. - Must be a member of "My Gear And Me - Gold Selection". - Must have at least 10 photos in "My Gear And Me - Gold Selection" pool. - Any member can be elected (including Moderators). We will produce a banner and put it in the front page of the group during that week for the elected member, but only with photos in MGAM-Gold Selection (will use the tag my_gear_and_me_gold to select the photos). Due to the recently changed rules imposed by Flickr staff, where every photo external to Flickr isn't loaded automatically, we decided to cancel this contest until further notice. Luís Marques is our first "My Gear And Me - Member of The Week". Siuloon is this week's "My Gear And Me - Member of The Week". N Gomes is this week's "My Gear And Me - Member of The Week". SusanaG1 is this week's "My Gear And Me - Member of The Week". steve.nichols2008 is this week's "My Gear And Me - Member of The Week". West County Camera is this week's "My Gear And Me - Member of The Week". Elżbieta 56 is this week's "My Gear And Me - Member of The Week". Lune Rambler is this week's "My Gear And Me - Member of The Week". Filó Diniz is this week's "My Gear And Me - Member of The Week". NataThe3 is this week's "My Gear And Me - Member of The Week". Barb is this week's "My Gear And Me - Member of The Week". Ionut Iordache is this week's "My Gear And Me - Member of The Week". jackfre2 is this week's "My Gear And Me - Member of The Week". tatizanon is this week's "My Gear And Me - Member of The Week". c.chamberland is this week's "My Gear And Me - Member of The Week". Rui Almeida is this week's "My Gear And Me - Member of The Week". Wilson Severino is this week's "My Gear And Me - Member of The Week". Ed Kreis is this week's "My Gear And Me - Member of The Week". davem44 is this week's "My Gear And Me - Member of The Week". Stephen Heron (Steve-H) is this week's "My Gear And Me - Member of The Week". Ralph Stewart (ralph.stewart) is this week's "My Gear And Me - Member of The Week". Islena is this week's "My Gear And Me - Member of The Week". Sevyl (Yves) is this week's "My Gear And Me - Member of The Week". Junga (Jim Norris) is this week's "My Gear And Me - Member of The Week". Quiria is this week's "My Gear And Me - Member of The Week". Steve aka Crispin Swan is this week's "My Gear And Me - Member of The Week". Soy Sissi is this week's "My Gear And Me - Member of The Week". hellen.888 is this week's "My Gear And Me - Member of The Week". Dragan is this week's "My Gear And Me - Member of The Week". oldt1mer is this week's "My Gear And Me - Member of The Week". foje64 is this week's "My Gear And Me - Member of The Week". limpus48 is this week's "My Gear And Me - Member of The Week". r.batista is this week's "My Gear And Me - Member of The Week". cnmark is this week's "My Gear And Me - Member of The Week". Nancy Violeta Velez is this week's "My Gear And Me - Member of The Week". R Hammitt is this week's "My Gear And Me - Member of The Week". alonsodr is this week's "My Gear And Me - Member of The Week". Booggie is this week's "My Gear And Me - Member of The Week". Dave Arnold is this week's "My Gear And Me - Member of The Week". Paulo Rui Martins is this week's "My Gear And Me - Member of The Week". msdstefan (Stefan Heinrich) is this week's "My Gear And Me - Member of The Week". Puzzler4879 is this week's "My Gear And Me - Member of The Week". Sonia Gomes is this week's "My Gear And Me - Member of The Week". Veronica Spagnoli is this week's "My Gear And Me - Member of The Week". Nuno S. Sousa is this week's "My Gear And Me - Member of The Week". Danilo Rastelli is this week's "My Gear And Me - Member of The Week". Atlantys is this week's "My Gear And Me - Member of The Week". nans0410 is this week's "My Gear And Me - Member of The Week". DANY1926 is this week's "My Gear And Me - Member of The Week". Katarina 2353 is this week's "My Gear And Me - Member of The Week". Justin Rice is this week's "My Gear And Me - Member of The Week". Harry from Portugal is this week's "My Gear And Me - Member of The Week". Atilla2008 is this week's "My Gear And Me - Member of The Week". Fjordblick is this week's "My Gear And Me - Member of The Week". Ray Horwath is this week's "My Gear And Me - Member of The Week". Sagar Lahiri (sapnamakha) is this week's "My Gear And Me - Member of The Week". BreakingWindPhotography is this week's "My Gear And Me - Member of The Week". miguel m2010 is this week's "My Gear And Me - Member of The Week". donsutherland1 / Don Sutherland is this week's "My Gear And Me - Member of The Week". irene carton is this week's "My Gear And Me - Member of The Week". Ticino-Joana is this week's "My Gear And Me - Member of The Week". bodulka is this week's "My Gear And Me - Member of The Week". carina10 is this week's "My Gear And Me - Member of The Week". Pete5D is this week's "My Gear And Me - Member of The Week". Damir B. is this week's "My Gear And Me - Member of The Week". Simon Baker is this week's "My Gear And Me - Member of The Week". Vestaligo is this week's "My Gear And Me - Member of The Week". FlyingColorsY2K11 is this week's "My Gear And Me - Member of The Week". Andy Short is this week's "My Gear And Me - Member of The Week". medhatiblu is this week's "My Gear And Me - Member of The Week". Biggi is this week's "My Gear And Me - Member of The Week". CountyPix is this week's "My Gear And Me - Member of The Week". Aquilant is this week's "My Gear And Me - Member of The Week". Susan~SARJ is this week's "My Gear And Me - Member of The Week". shoot that! is this week's "My Gear And Me - Member of The Week". moni_mel5 is this week's "My Gear And Me - Member of The Week". mclcbooks is this week's "My Gear And Me - Member of The Week". kootenayphotos.com is this week's "My Gear And Me - Member of The Week". Filip Nystedt is this week's "My Gear And Me - Member of The Week". Chalkie7 is this week's "My Gear And Me - Member of The Week". frank.hs is this week's "My Gear And Me - Member of The Week". Deano H is this week's "My Gear And Me - Member of The Week". Damir Smoljan's is this week's "My Gear And Me - Member of The Week". UrbanMescalero is this week's "My Gear And Me - Member of The Week". hedgey_ is this week's "My Gear And Me - Member of The Week". Polježičanin is this week's "My Gear And Me - Member of The Week". glemoigne is this week's "My Gear And Me - Member of The Week". MagnusL3D is this week's "My Gear And Me - Member of The Week". Muchan5 is this week's "My Gear And Me - Member of The Week". unlimited inspirations is this week's "My Gear And Me - Member of The Week". HawaiianVirtualTours is this week's "My Gear And Me - Member of The Week". Wilma1962 is this week's "My Gear And Me - Member of The Week". gilxxl is this week's "My Gear And Me - Member of The Week". ystenes is this week's "My Gear And Me - Member of The Week". Luis Diaz Devesa is this week's "My Gear And Me - Member of The Week". Nadia & Casey is this week's "My Gear And Me - Member of The Week". GVG Imaging is this week's "My Gear And Me - Member of The Week". ANDY LEDDY is this week's "My Gear And Me - Member of The Week". Rui Trancoso is this week's "My Gear And Me - Member of The Week". carhove is this week's "My Gear And Me - Member of The Week".